The wedding ceremony template can show even the smallest proceedings that the holy matrimony will be in their corresponding schedules. By the help of Wedding Program Templates all of the happenings will be running as planned in the wedding day, in its sample format there will be a lot saved time and effort as it can provide you the readymade layout. 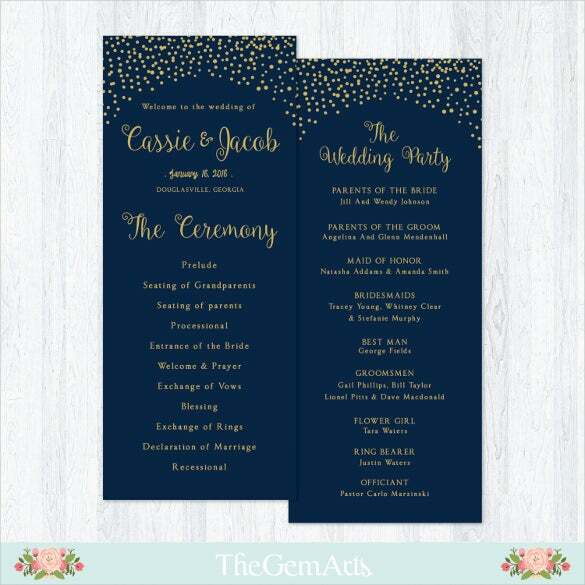 The designs and patterns for the ceremony sheet can be personalized so you can have it made on your own preference Wedding Templates or by the request of the couple. 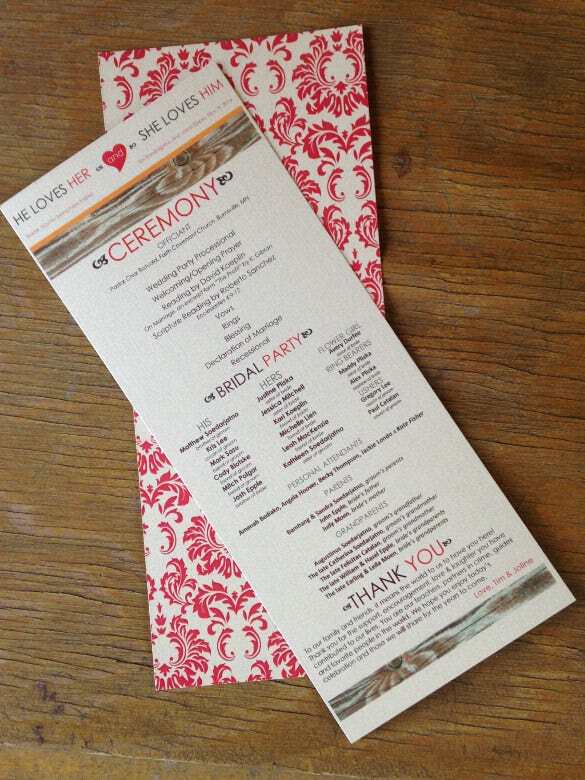 It will inform all the visitors and personnel on what will happen in the bridal ceremony itself. 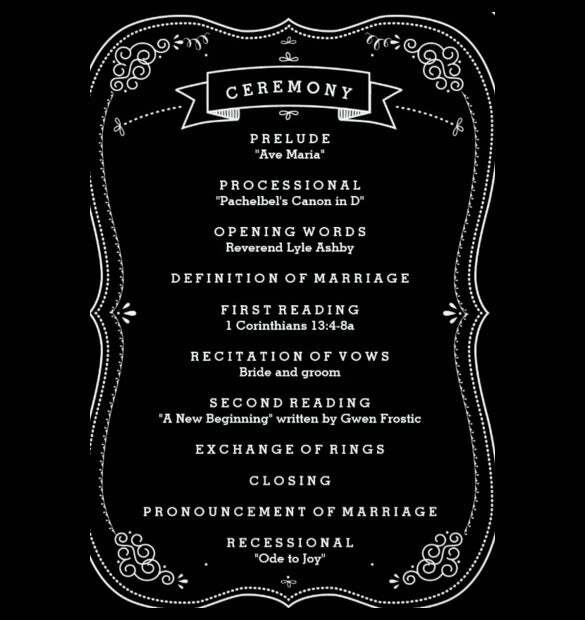 kaileymichelle.com | This simple wedding ceremony outline has a readymade layout providing the entire proceedings and events scheduled during a holy matrimony. This free to download PDF template also comprise of ‘’The Art of Marriage”, a frequently recited English poem during Wedding ceremonies. This premium wedding ceremony script is an excellent template to completely customize the wedding ceremony programs to every individual requirement. It offers personalized ink color choice, three rounds of proof revisions and accepts rush orders for little additional charge. 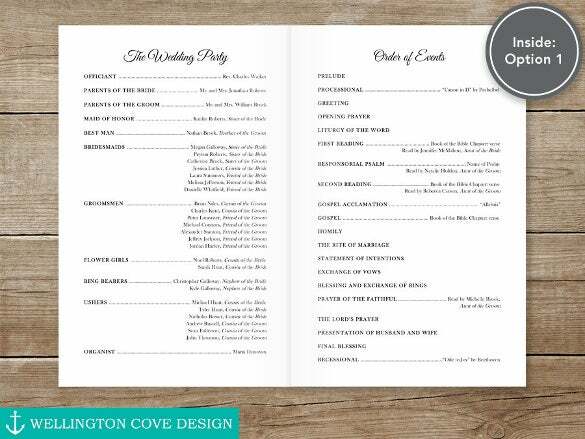 This simple wedding ceremony layout allows customers to design a super stylish program for their wedding ceremony at an affordable cost. This high quality paper allows full color, full bleed printing and easy customization of colors, texts, fonts and sizes. 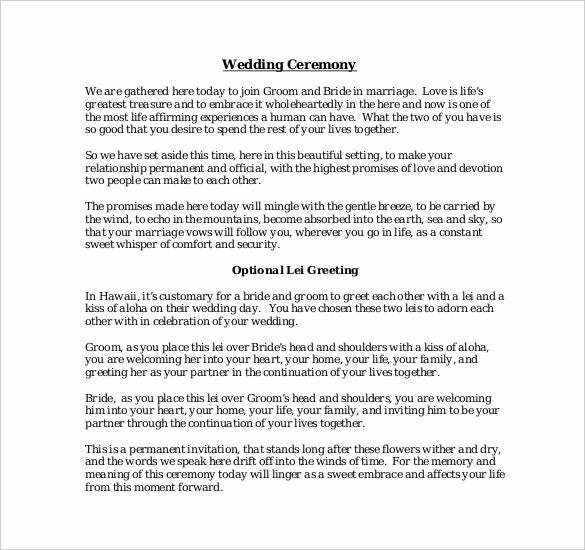 kauaiofficiant.com | This wedding ceremony layout has a humanistic style simple wedding ceremony script that allows the wedding planners to create their own basic script. 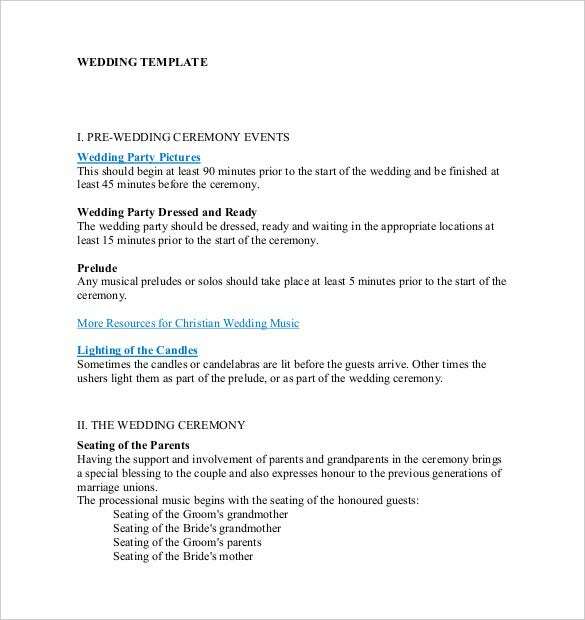 This free downloadable template comprises of many examples of optional openings, vows, Ring exchange wording options, closing and pronouncement. 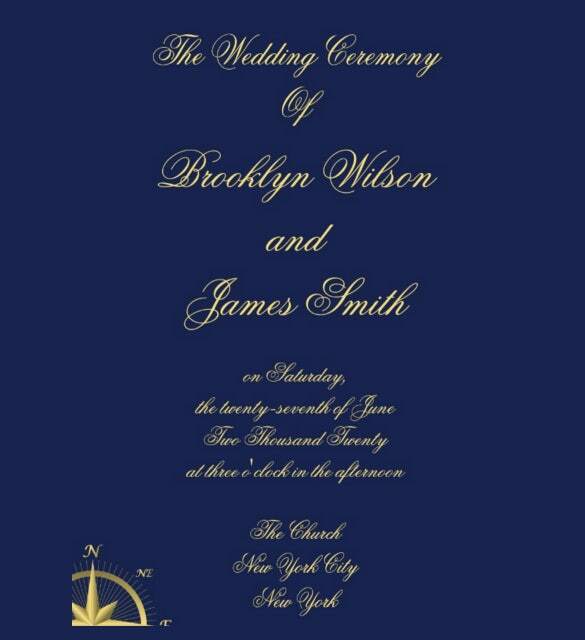 This premium wedding ceremony layout comprises of high resolution digital file in PDF and JPG format that are best for designing personalized wedding invitations. 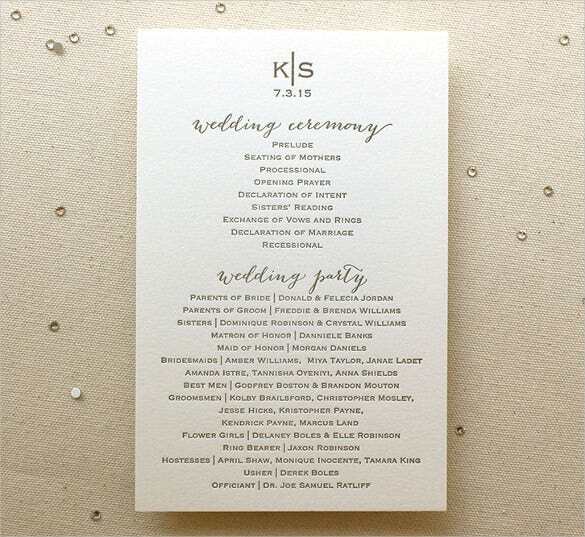 This minimalist wedding ceremony program has two sides and allows the users to custom order by specifying the ceremony details. This elegant black and white wedding ceremony programs comes with high quality, full-color, full blled printing in both landscape and portrait layout options. This premium template allows users to upload their graphics, logos and customize both the sides free of cost. 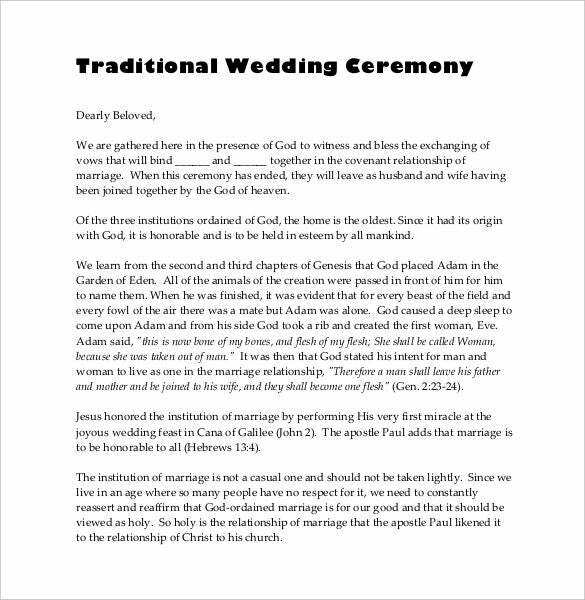 expositorysermonoutlines.com | This typical wedding ceremony template has PDF file detailing the traditional marriage ceremony proceedings that is available for free download. 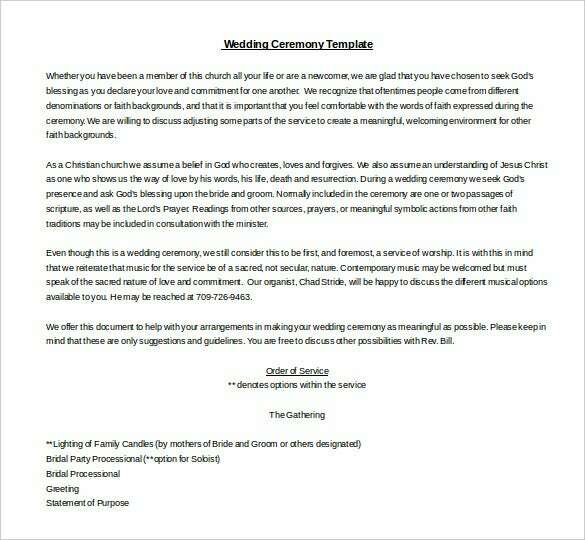 It contains the complete script for vows and exchange of rings ceremonies and traditional prayer script. 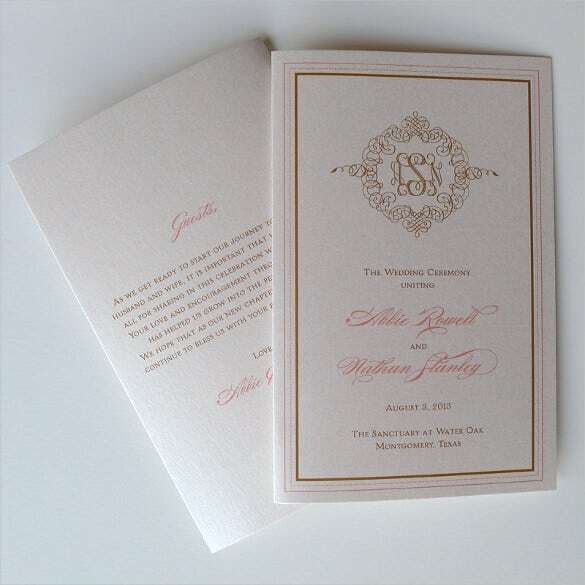 This elegant Monogram wedding ceremony programs are perfect way to give the ceremony details to the guests of marriage ceremonies. The classic monogram style fonts present beautiful and classic look to the program list that can be customized by opting the preferred color. 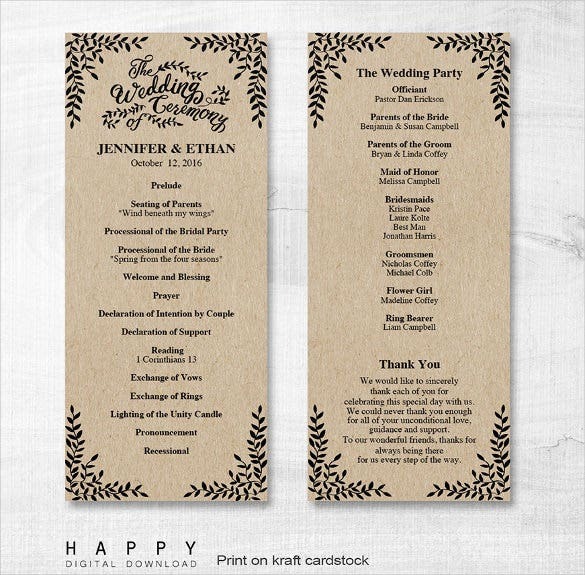 This excellent wedding ceremony layout template is ideal for making custom invitations by adding photos and texts to both sides of the card. It has 12 unique paper types and colors that are high quality, full color with full-bleed printing provision. 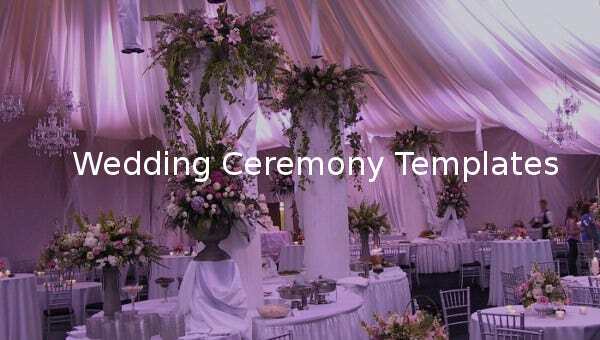 the-gathering.ca | This simple wedding ceremony outline has complete details about pre-wedding ceremony events, actual wedding ceremony events with exact time specifications for each event. This free-downloadable PDF file provides detailed procedures including seating of parents, wedding march and opening remarks. 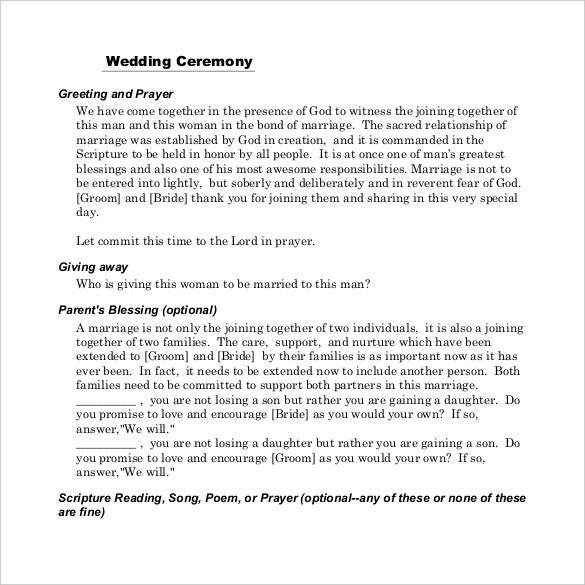 This simple wedding ceremony program folding template for Microsoft Word comes with easily printable digital file that can be printed on a home printer or outside print shop. This premium template allows users to customize fonts, text color, text size, border color and text location. This stylish chalkboard vintage wedding program card is easy to customize and comes with 8 additional styles and 6 shape styles. 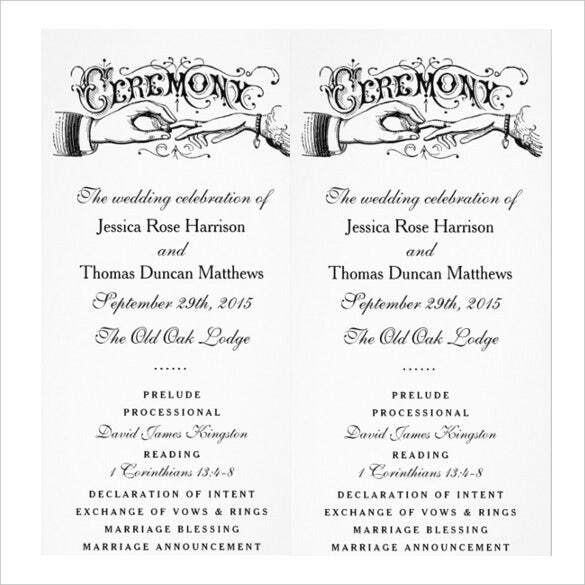 Users can choose from 12 unique paper types, 2 printing options and 6 color shape options to prepare custom wedding ceremony invitations and announcements. 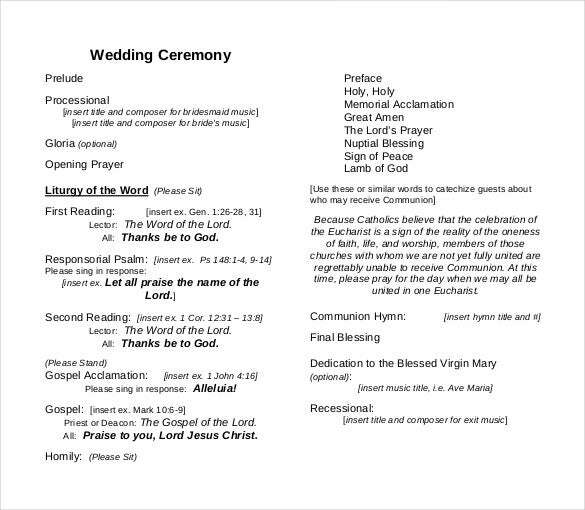 wesleychurch.ca | This wedding ceremony order with readings comes as word document that is available for free download. It has complete ceremony details and provides scripture suggestions, different options for wedding ceremony, different choice of words during exchange of vows and declaration of Intent. 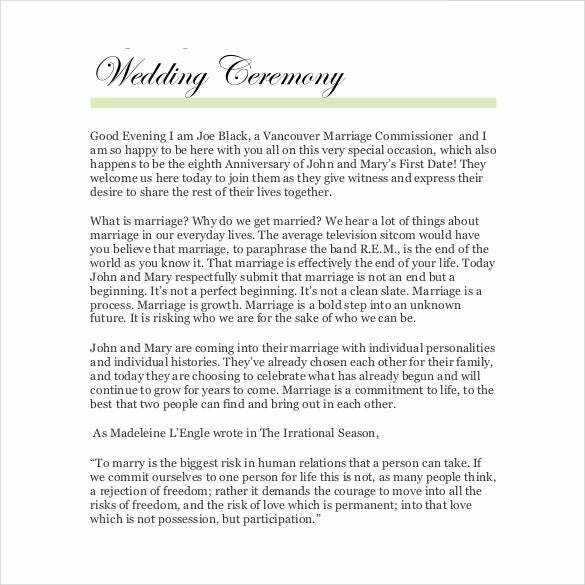 This unique wedding ceremony layout is perfect choice to design custom wedding ceremony program including post ceremony details and giving fun facts about the couple. 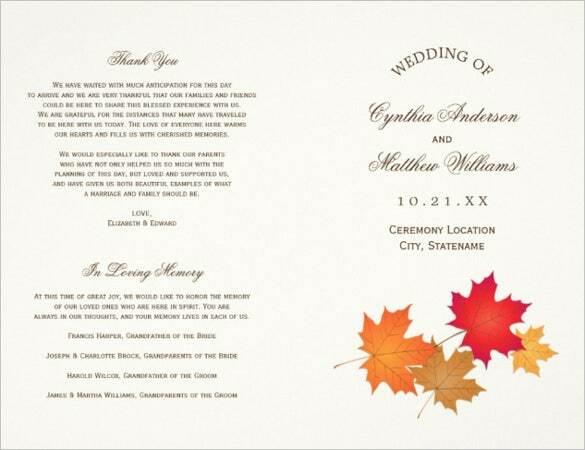 This premium template allows users to design the card with their preferred wedding theme and colors. 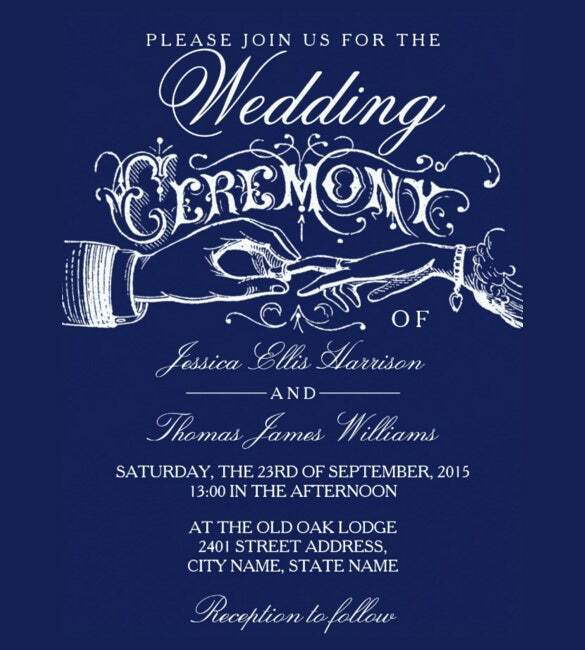 This excellent template is very ideal to design customized wedding invitation cards in matte finish and smudge-free writing. It has both portrait and Landscape dimensions and allows the users top add photos and texts to all sides of the card at no extra cost. These various wedding ceremony templates provides different sample formats that are very ideal to prepare a personalized ceremony sheet as per the desired requirements of the marriage planners. 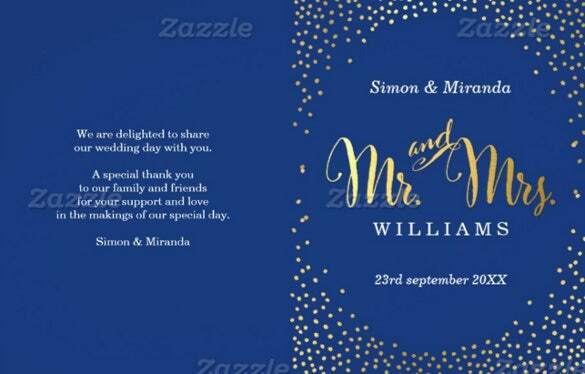 The customized cards will ensure that all the friends, relatives and visitors are properly informed about the happenings of the marriage ceremony.